We perform analysis to anticipate threats to human security. ISciences performs analysis to anticipate threats to human security. We assess current and future threats to water security, food security, energy security, and public health. We often use an analytical framework for vulnerability analysis in sustainability science proposed by Turner II et al. (2003). In this framework, vulnerability is defined as expected harms that are the result of cumulative changes and stresses in a coupled human-environment system. "Vulnerability is defined as expected harms that are the result of cumulative changes and stresses in a coupled human-environment system." Stresses emerge from variability in both human and natural systems and interact with one another over multiple time-scales in manners that potentially impact the ability of a place to function as expected. long-term (e.g., climate change, population growth). adaptive capacity (ability to transform to a new configuration in order to address changing conditions). Places have differential sensitivity to different patterns of stresses and also have differential capacity for coping, recovering, and adapting to stresses. For instance, rainfed agricultural systems are sensitive to soil moisture deficits, whereas irrigated agricultural systems are sensitive to water deficits from point sources (e.g., surface water and shallow groundwater). The system also has multiple feedbacks over time. Outcomes can alter the pattern of subsequent stresses, the sensitivity of a place to those stresses, and the capacity of a place to manage stresses. Places are connected to one another via trade, communications, and cultural connections. Coffee growers in Colombia and wheat buyers in Egypt, for example, are extremely sensitive to global commodity prices even if local conditions are near normal. At ISciences, we assess current and future threats to water security, food security, energy security, and public health. The ISciences Water Security Indicator Model (WSIM) monitors and forecasts droughts and floods on a near global basis. Each monthly report documents current conditions and forecasts future conditions with lead times of 1-9 months at 0.5°x0.5° resolution. WSIM has been in continuous operation since April 2011 and has proven to provide reliable forecasts of emerging water security concerns in that timeframe. WSIM forecasts have been validated against subsequent observations. WSIM includes the capability to assess impacts of droughts and floods on people, agricultural production and electricity generation. ISciences partnered with the Pacific Disaster Center to develop the Lower Mekong Basin Flood Vulnerability Atlas - a spatially explicit assessment of vulnerability to flooding in the Lower Mekong Basin. This assessment considered exposure to flooding, sensitivity to flooding, and resilience to flooding to develop an overall assessment of vulnerability. 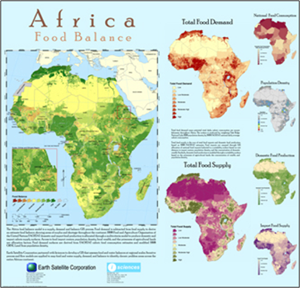 ISciences partnered with Earth Satellite Corporate, now MDA Information Systems, to develop geospatial indicators of food and water security for Africa. We also demonstrated that these indicators could be used in an integrated assessment framework that reliably predicts food crises. ISciences assesses the impact of climate change and climatic extremes on energy security. We developed a unique global database of electricity generation facilities, fuel stocks, cooling technologies, and locations by merging and augmenting multiple commercial and open science data sources. We use this database to assess risk to tropical storms, water stress, and climate change. Our Water Security Indicator Model (WSIM) uses this database to evaluate the degree to which water deficits restrict electricity production from hydropower and thermal plans (including nuclear). ISciences partnered with Prof. Svea Closser at Middlebury College to assess the possibility of unintended side-effects of targeted polio eradication campaigns on routine immunization (RI) and primary health care. Our quantitative analysis did not find compelling evidence of widespread and significant effects of polio eradication campaigns, either positive or negative, on measures of RI and maternal healthcare. However, a companion qualitative analysis revealed context-specific positive impacts of polio eradication activities in many of our case studies, particularly disease surveillance and cold chain strengthening. These impacts were dependent on the initiative of policy makers. Negative impacts, including service interruption and public dissatisfaction, were observed primarily in districts with many campaigns per year. Results are presented in "The Impact of Polio Eradication on Routine Immunization and Primary Health Care: A Mixed-Methods Study" and methods are presented in "Methods for evaluating the impact of vertical programs on health systems: protocol for a study on the impact of the global polio eradication initiative on strengthening routine immunization and primary health care".